Spatial sound diffusion is usually associated with electronic and electroacoustic music. Over the course of the 20th century a number of institutions were created that allowed pioneering composers to experiment with spatial audio diffusion, in most cases under the generous tutelage of government agencies. When Edgard Varèse speculated about new instruments that would enable composers to direct the movement of sound mass through space in the 1930s, he probably was not thinking of a jumble of tubes and brass horns suspended above the audience with steel wires – if only he had, he might have been able to realize his ideas more completely during his lifetime. Spat’Sonore is an ensemble based in Paris that has developed and performs with a low-tech cousin of the neighboring GRM’s acousmonium, the orchestra of loudspeakers developed at the Maison de Radio France. 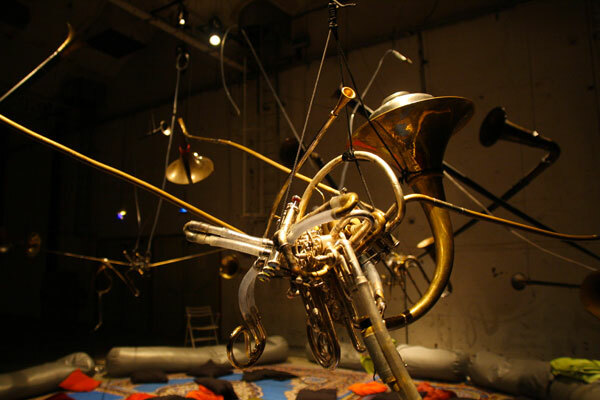 A hand-operated piston system repurposed from brass instruments is used by each of the members of Spat’Sonore to direct the airflow from their lungs to one of several horns suspended around the listening space through a network of rubber pipes. Functioning in a similar way to a mixing board, this assemblage allows the musicians to perform both improvised and composed spatial sound trajectories, extending their oral cavity through one or several openings in the network of tubes. The audience is housed inside a steampunk-esque dome that would not be out of place in early Jean-Pierre Jeunet movies. Employing extended instrumental techniques different sound textures are projected around the audience, mimicking the shape-shifting quality of electronic generators and loudspeakers. Audience members soon forget about the brass instruments, becoming immersed in an acousmatic listening experience. This is a case in which new technologies open the way for practices that could have been otherwise developed, at least speculatively, in a different time and place.